Princeton University Press is offering Robert Shiller book: Phishing for Phools: The Economics of Manipulation and Deception at the author’s discount of £12, to participants in the lecture. Pre-ordered books can be collected at the venue. Please contact marco.severi@gmail.com or ryan_a_mathias@yahoo.com, if you are interested in ordering a copy. (Please bring cash to the event). Robert J. Shiller is Sterling Professor of Economics, Department of Economics and Cowles Foundation for Research in Economics at Yale University, and Professor of Finance and Fellow at the International Center for Finance, Yale School of Management. He received his B.A. from the University of Michigan in 1967 and his Ph.D. in economics from the Massachusetts Institute of Technology in 1972. He has written on financial markets, financial innovation, behavioral economics, macroeconomics, real estate, statistical methods, and on public attitudes, opinions, and moral judgments regarding markets. His repeat-sales home price indices, developed originally with Karl E. Case, are now published as the S&P/Case-Shiller Home Price Indices. The Chicago Mercantile Exchange maintains future markets based on the S&P/Case-Shiller Indices. He has been research associate at the National Bureau of Economic Research since 1980, and has been co-organizer of NBER workshops on behavioral finance with Richard Thaler since 1991, and on macroeconomics and individual decision making (behavioral macroeconomics) with George Akerlof from 1994 to 2007. He served as Vice President of the American Economic Association in 2005, and as President of the Eastern Economic Association in 2006-07. He has been elected President of the American Economic Association for 2016. In 2013 Robert Shiller was the recipient of the Nobel Prize in Economic Sciences jointly with Eugene Fama and Lars Peter Hansen. 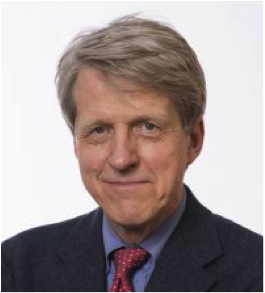 The Yale Club of London, and the London School of Economics are proud to invite you to attend a private lecture with Professor Robert Shiller. Professor Shiller will be in London to introduce his new book, written in collaboration with George Akerlof: Phishing for Phools: The Economics of Manipulation and Deception. In their book, the authors challenge the view that free markets fundamentally deliver us prosperity. When there is profit to be made, sellers will systematically exploit our psychological weaknesses and our ignorance through manipulation and deception, and markets are inherently filled with tricks and traps and will 'phish' us as 'phools'. As too many optimists have learned to their detriment, asset prices volatility involves a whole ocean of phishes. With his thought provoking narrative, Shiller will tell us how borrowers are lured into unsuitable loans; firms are stripped of their assets; accountants mislead investors; and the digital media amplifies the irrational exuberance that seems to follow a pattern well known to the author. We invite all Yale and LSE alumni and their guests to participate to the lecture, together with alumni of the Global Network for Advanced Management member schools.